Vision Health Specialties places quality and excellence at the forefront of our eye care. Our commitment to providing outstanding services to our patients continues on due to the combination of our professional doctors, trained staff, and years of experience. 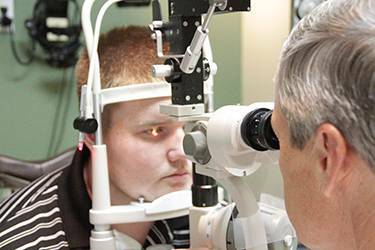 Every adult and child should receive annual eye exams to ensure long-term, healthy vision. Our practice caters to so many patients of all ages from correcting nearsightedness in children or eye emergencies to managing eye diseases & conditions including glaucoma, cataracts, diabetic retinopathy, dry eye syndrome, and macular degeneration. Our practice is proud to work alongside EyeLASIK Midland and provide co-management for laser vision correction surgery. Not only does EyeLASIK Midland provide Midland, TX with the latest in LASIK & refractive surgery, but patients rest assured they receive thorough evaluations as well as pre & post-op exams by our eye doctors that are next door. We also perform eye exams for contact lenses and carry the latest in designer glasses at our eyewear boutique. Our opticians and staff are available to help you reorder your annual supply of contact lenses and even minor eyeglass repairs and adjustments. So, whether you’re coming in for a routine eye exam to update your prescription on eyewear or searching for expert guidance on managing an eye condition, Vision Health Specialists strives to continue to offer a comprehensive list of eye care services to cater to all our patients’ visual needs. We use the most up-to-date technology to ensure the best eye care possible. Learn about the different types of tests and equipment you may experience on a visit with Vision Health Specialties. Make sure to ask your doctor about laser vision correction treatments available through Vision Health Specialties. Unlike a routine eye exam that assesses your visual system and eye health, anyone who was diagnosed with type 1 or type 2 diabetes requires an additional test for their eye exam.